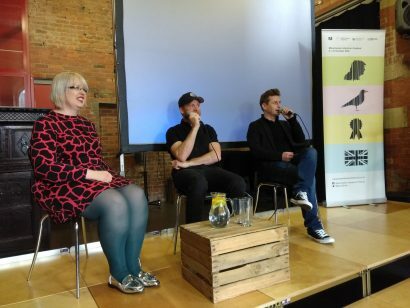 Centre for New Writing student, Thomas Lee, reviews one of the first events of the 2018 Festival. In the redbrick engine house at the Anthony Burgess Foundation we find Norway’s ‘Most American Author’ and one of Switzerland’s most widely translated novelists. They are both mountain men: they ski, they snowboard, they go to the mountains for isolation and tranquillity, but also to procrastinate. For Nicolai Houm and Arno Camenisch, skiing is ‘the best way to avoid writing’. They are fathers too, and their writing is increasingly fuelled by concern for their children. Houm and his wife ‘take avalanches more seriously than they used to’, since they became parents. He writes partly to expunge the anxieties of parenthood. What’s the worst thing that could happen to his daughter? His third novel, The Gradual Disappearance of Jane Ashland, is his attempt to answer that question. Camenisch is worried by climate change. He feels it deep in his heart. He sees the change: the warm Swiss summers, the melting glaciers. He wonders what kind of world we are leaving for our children. His latest book, The Last Snow, is about snow lift operators, whose way of life is threatened by a dearth of snow and customers. Nicolai Houm does things differently. He “thinks too much”. His writing is “more intentional”. When he stands up to read, his own prose feels extremely deliberate. We are launched into a careful consideration of grief and recovery, rendered like a vivid memory of a real conversation. We can see the psychiatrist’s office, brought to life with sparse, lancing pieces of description. The psychiatrist has eyes ‘surrounded by dry wrinkly skin, like a parrot’s’. He ‘smiles like a grandfather, having to deal with a difficult grandchild’. Camenisch writes with his tongue in his cheek. Perhaps his work benefits for being translated from Romansch, his native language, ‘just a little language spoken down there in the mountains of Switzerland’. He writes in Romansch, and in German, and assures us that his English is not very good. In German, he claims, he can read for an hour from memory. In English he must read from the book. Which he does, raising chuckles with vignettes of bad driving and adolescent indiscretion: “My grandmother is naked in front of me. I can’t look away, my neck is made of wood. I’ve never seen nona bollock before. She’s totally bollock. Suddenly I can’t talk anymore. My nona bollock has taken my words away.” His prose is refreshing, like crisp mountain air. Eventually he enlists Naomi to read in English for him, and he reads extracts in Romansch instead. We cannot tell what is being said, only that he enjoys saying it: rocking on his heels, emphasising words with his eyebrows and with his free hand, smiling as he reads.